Chabad provides programs and activities for all ages to celebrate, learn and grow together. 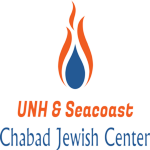 The UNH & Seacoast Chabad Jewish Center is a new organization in town, but it brings with it some of the oldest and richest Jewish traditions. Our aim is to give meaning, share joy, and add spirituality to the every day. Our dream is to teach these values in a warm and nurturing environment where families can grow together, enjoying life and Judaism simultaneously. Together we can kindle the spirit of Jewish values in our homes. Chabad recognizes all Jews, regardless of their affiliation, perspectives on Judaism or levels of observances. A Jew is a Jew. Period. We have one G‑d. We have one Torah. And we are one People.